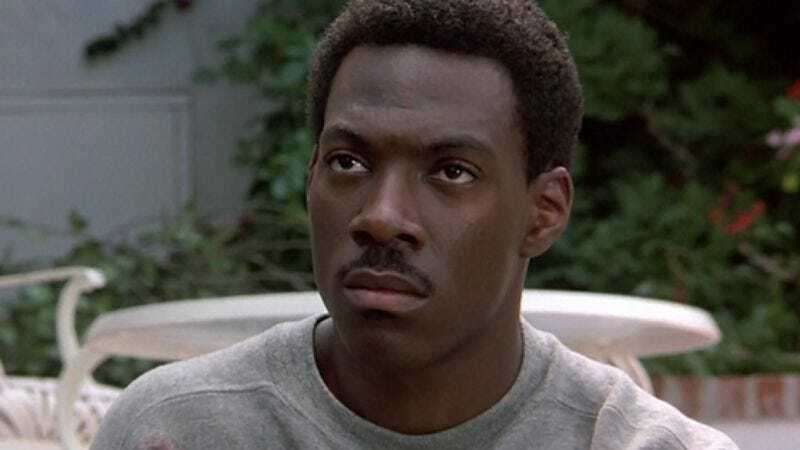 The Beverly Hills Cop TV series that forces you to question whether affection for Shawn Ryan's work supersedes your natural aversion to a small-screen reboot of an '80s Eddie Murphy character just got another variable hiccup, as Deadline confirms that the show will now be one of CBS's many "light procedural" cop shows. The network has given the would-be series a pilot production commitment, guaranteeing that at least one hour will be filmed of the adventures of Axel Foley's "blue-collar police officer son, Aaron, who helps take down the criminal elements of the rich and famous in Beverly Hills, while trying to escape the shadow of his larger than life father." This, of course, is made all the more difficult by the fact that Murphy intends to appear occasionally as said father, and the fact that—as we pointed out when it was announced—Aaron insists on working in Beverly Hills. Seriously, there are rich people doing bad things in other cities where your dad didn't put bananas in tailpipes and so on. Anyway, still no hint of a role for Judge Reinhold or even a lemon tweest of Bronson Pinchot, but obviously the arguments will begin immediately over who should play Murphy's son, in the form of shouting out every black actor you can think of, regardless of their current commitments. Donald Glover! Jay Pharoah! Michael B. Jordan! Kevin Hart! Damon Wayans Jr.! Damon Wayans! Steve Harvey! Arsenio Hall! Morgan Freeman!